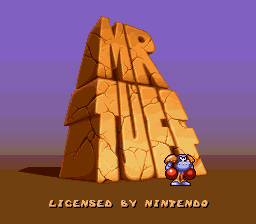 Mr. Tuff is a 2D platform game in development by Sales Curve Interactive (SCI) and presumably set to be published by Ocean in 1994-1995. The game was done by the same people as Super SWIV, and as such, the graphics are incredibly polished. The game was apparently too ambitious, and was never fully complete (although the game engine and graphics certainly indicate that it is close). 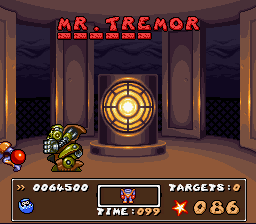 The game follows a demolition robot known as Mr. Tuff. After the entire population of earth escapes to the planet Utopia, the army robots take over the world. It is up to Mr. Tuff to save the world for the peaceful domestic robots. The levels involve standard platform action, though there are a few shooter-esce hoverboard levels. Each world is set up into standard levels and a boss level. There are two known prototype roms for this game. As far as I can tell, they are pretty similar in terms completion. 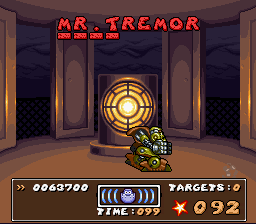 The "Lost Levels" prototype, which I am releasing here, is less complete. The title screen has a date of July 12, 1994 and is stated to be version 0.90. The game is apparently optimized to be PAL, and is not explicitly programmed to be detected. So, if you play this game in an emulator without forcing PAL, it will appear to run too fast. Some of the sound effects aren't programmed in yet, and there are some areas where there are more enemies than in the later beta. I've played through the first two worlds in this game, and it the game seems quite close to completion. The password system is not in operation, so using save states is a must, as your health doesn't reset between stages. 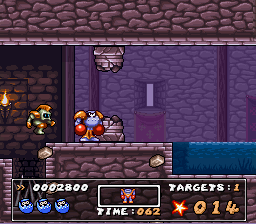 The control system works well, so the challenge comes from getting the enemies before they get you. There have certainly been worse games released. It seems as if this one may have been delayed a bit too much and the publishers did not want to release it with the heavy competition in the 2D platform market. 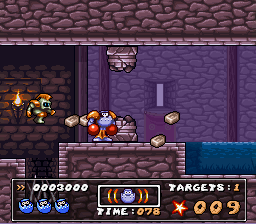 Download "Lost Levels" early prototype of Mr. Tuff here.